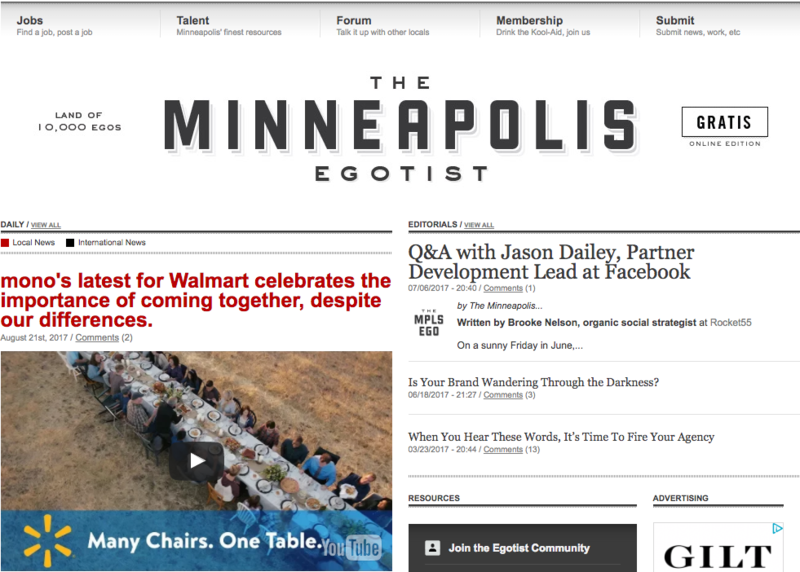 MINNEAPOLIS, MINN.: ACH Communications, a Minneapolis-based social media and digital marketing consultancy, introduced a new, fully-featured web site to the marketing and PR world this week at www.arikhanson.com. The new site represents a significant upgrade for the company and promises to result in an enhanced reputation for the firm. State-of-the-art home page slider showcases world-class photograhy (courtesy of Erica Hanna and MIMA) that accentuates the user experience. Cutting-edge client ribbon bar half-way down the home page features a long list of ACH Communications clients. Innovative “Start a Project” button allows visitors to contact ACH directly to start a working relationship. Other new pages on the site include: a training page devoted exclusively to the new “sparked”social and digital training program that begins Nov. 4 at The LAB in downtown Minneapolis; a podcast page featuring recent episodes of the world-renowned Talking Points Podcast; and a blog page showcasing the now more than a 1,000 posts written for the newly minted Talking Points blog (formerly Communications Conversations). The site was developed in partnership with Flex Creative in Lakeville and includes photography from Erica Hanna and MIMA. About ACH Communications. ACH Communications is a marketing and communications consultancy that has been driving business results for clients since 2008. With more than 20 years’ experience in traditional and digital marketing, communications and public relations, ACH brings seasoned, strategic expertise to help today’s leading organizations, including Fortune 500 companies like Select Comfort, Walgreens, General Mills, Toro, Cargill and Ingersoll Rand, define and deliver on their marketing and communications goals through the right mix of tools and strategies. Content Marketing World (just a few weeks ago!). I haven’t been to a single one of these events in my now more than 20 years in the business. I think my friend Greg Swan has been to every SXSW since its inception. Many of my PR friends have been to the PRSA National Conference multiple times. And, I know a lot of people from Minnesota visit San Diego each year to attend Social Media Marketing World. 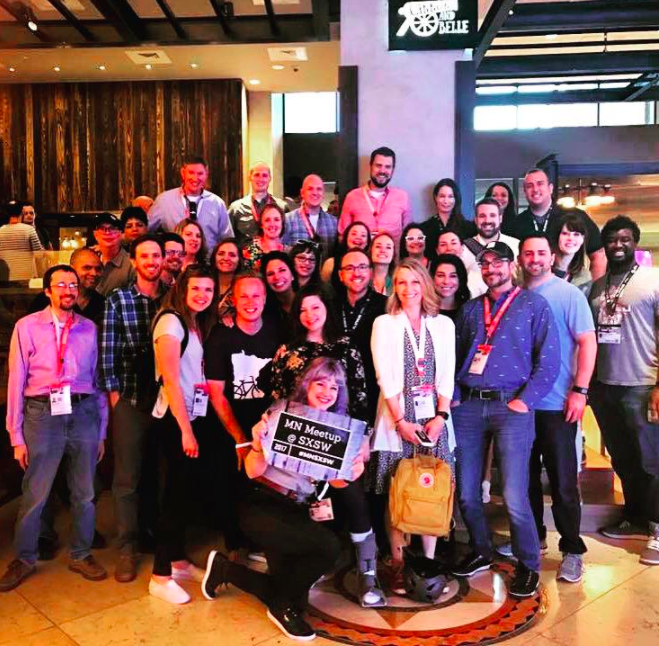 Bottom line: I have some big-time national industry conference FOMO. I see friends hitting cool parties at SXSW, learning about innovative technologies in digital marketing and seeing first-hand some pretty interesting brand executions in Austin each year. I see other folks attend Content Marketing World in Cleveland each year and listen to speakers like Kevin-freaking-Spacey present. Damn, that looks like fun (and that event is in CLEVELAND for crying out loud!). I see friends attending the PRSA National Conference each year and going out to dinners with all sorts of people I know and have met over the years through Twitter, blogging and my PRSA involvement. You’re away from your family for a number of nights–not ideal for anyone with little kids. You’re staying in a hotel room eating crappy take-out or Applebee’s. And, of course, you most likely have to take a jet plane to get to said conference (which, as I get older, bothers me more and more). Not to mention the largest downside: $. A trip to SXSW would most likely run me $4,000-5,000. Easy for agency and corporate folks to go when the mothership is paying. When you’re a solo, the four grand comes straight out of your bank account. And, it gets pretty tough to make a case why you should spend 4K to go to Austin to go to a bunch of parties. How do I deal with this serious FOMO? I stay, and focus on, the local scene. Which, as many people will tell you in Minnesota, is pretty damn solid. You see, I don’t necessarily benefit (from a business perspective) by networking with people in Atlanta, San Diego or Austin. I’m not looking for clients there. I’m not looking to pick up and move to a new job. I’d prefer to get to know even more people right here in my backyard in Minneapolis. So, I choose to attend events like the MIMA Summit each year (which is an incredible event, if you haven’t been–and it’s coming up on Oct. 12!). I choose to continue the two mastermind groups I run, and add great members to those. 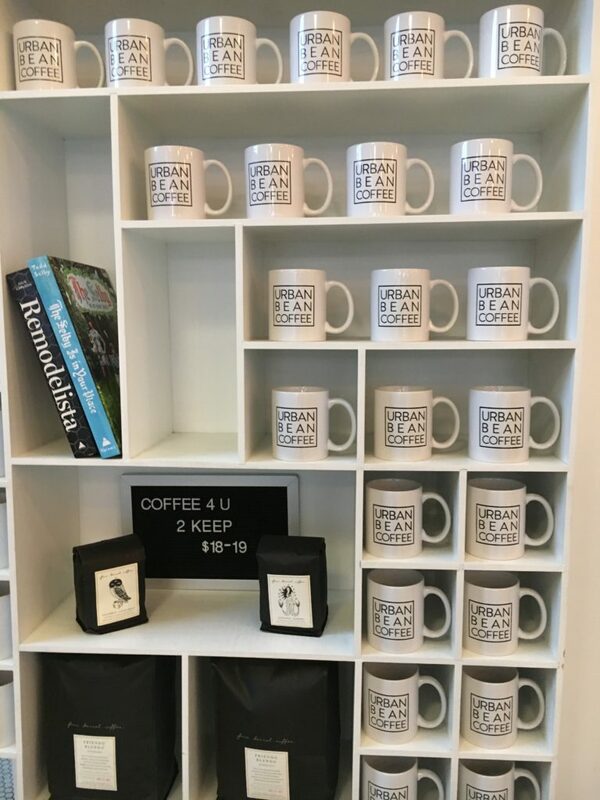 I choose to continue my coffee regiment and meet-up with smart people like Jim Cuene, Kendra Klemme and Jillian Froehlich. I’m not going to lie–going to Austin and SXSW in March still looks like an incredibly good time. But, I’m happy to stick with my local events and networking as (at least for me), it feels more focused and a better use of my time. Curious–where do you fall on this issue? Do you attend national industry conferences? Why or why not? And, do you think they make a difference for your career trajectory? Note: Photo courtesy of Carl Bliss (thanks, Carl!). Each week, I put together and distribute The Talking Points e-newsletter (sign up here). It’s full of stories and articles designed to help people like YOU do your job’s just a little bit better. And, it’s also full of jobs I think would be interesting to readers. 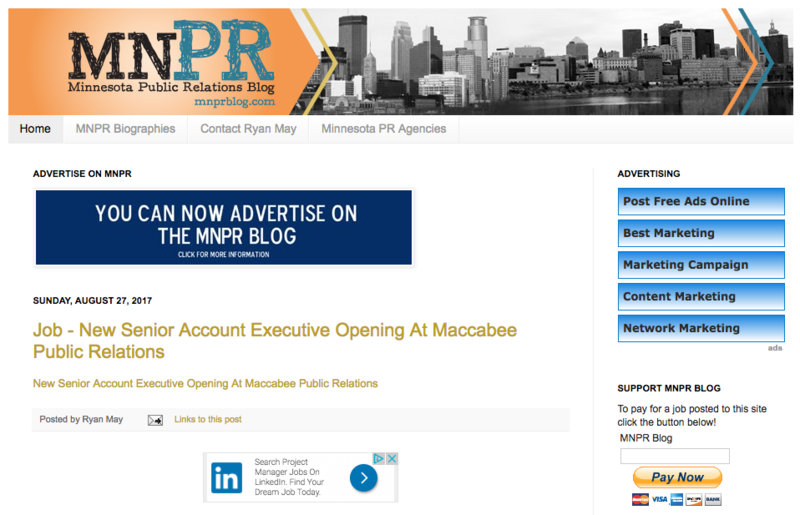 The longest-running PR blog in Minnesota–and, truth be told, one of the longest-running PR blogs in the entire country. Kudos to Ryan May for creating this resource so many of us use on a weekly basis. I don’t pull every job from this blog, but I definitely check it each week. 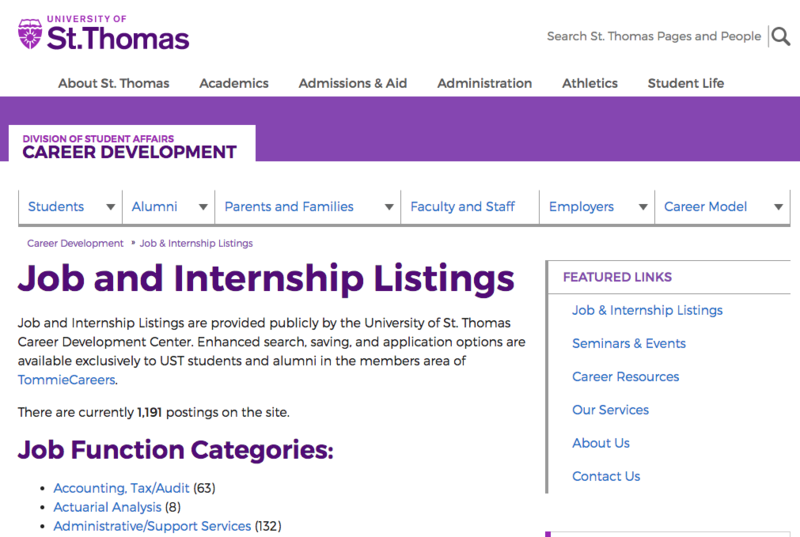 More focused on internships and beginner-level positions, but definitely a resource I look at each week. Tends to include more positions at mid-sized orgs, media enterprises and non-profits, but still worth checking. In particular, I look under “Communications-Public Relations”, “Advertising” and “Marketing and Brand/Product Management”. 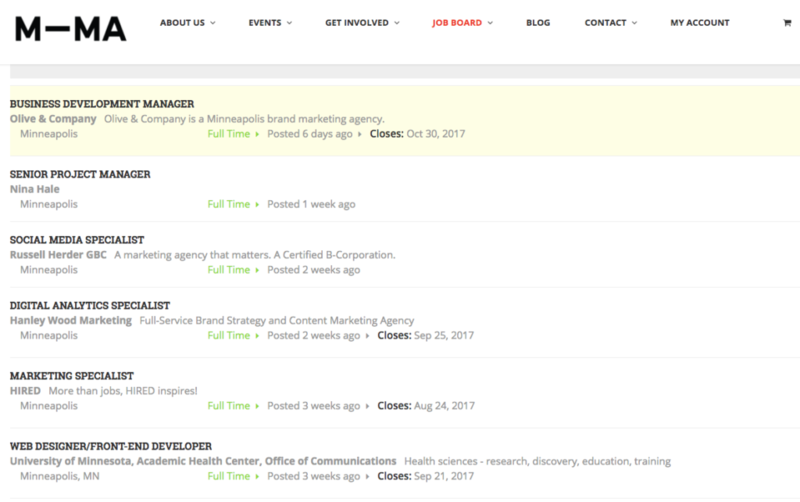 Typically doesn’t have a ton of listings, and they do tend to overlap with the MN PR Blog, but worth a quick glance each week. As you’ll see, I use LinkedIn in a dual-purpose when searching for jobs. In this case, I’m clicking on the “jobs” tab at the top of the page. 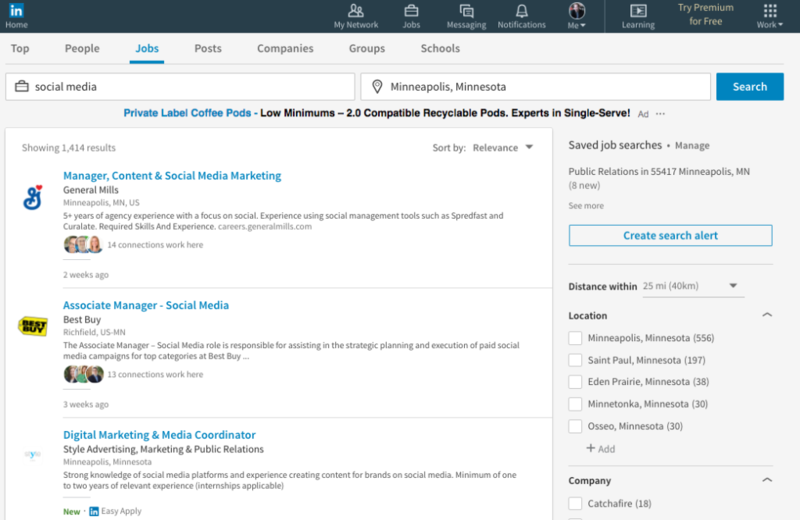 Then, I’m typically searching for “public relations” and “social media” positions in Minneapolis. Over the last couple years, that typically brings up a decent amount of jobs each week. You’d be surprised. 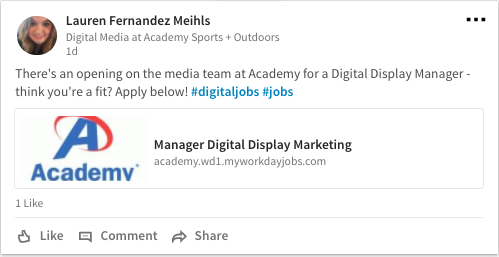 The other way I use LinkedIn is to peruse my feed 2-3 times per day for people posting about local jobs here in Minneapolis/St. Paul. This usually yields 2-3 jobs a week–these are positions my friends, colleagues, clients and former clients are posting. And, these are typically the kinds of jobs that aren’t posted to some of the other resources listed here. I usually click through to the jobs and bookmark the sites (using Feedly and my friendly Feedly bookmarklet) for reference later. This site was one of my biggest sources of jobs up until a few months ago when they redesigned the site. Now, it seems a little tougher to uncover jobs the way I did before. Regardless, a great site to visit weekly. More focused on ad-related jobs, but I still check it each week. 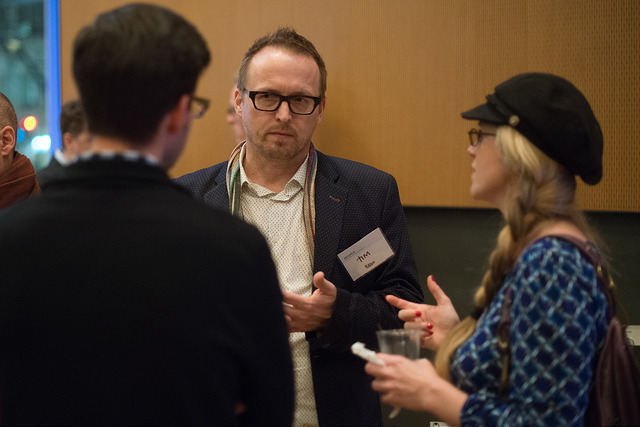 Why are brand-side PR pros less networked than their agency peers? In case you missed it, AdFed recently held their wildly popular 32 Under 32 Awards. As usual, more than 100 people were nominated (105 to be exact). And, as usual, a large chunk of those nominees came from one area of our industry. 74 percent of the #32Under32 nominees were agency-side folks (I haven’t seen a published list of the winners yet). A full 78 of the 105 nominees. I’m too lazy to do the math, but glancing at previous years winners, I see a heavy skew toward agency folks, too. Because it lends credence to a trend I’ve long noticed, and often wondered about: Why are agency people far more networked than their corporate peers? This is all based on a loose collection of assumptions. But, hear me out because I think it’s an interesting discussion. 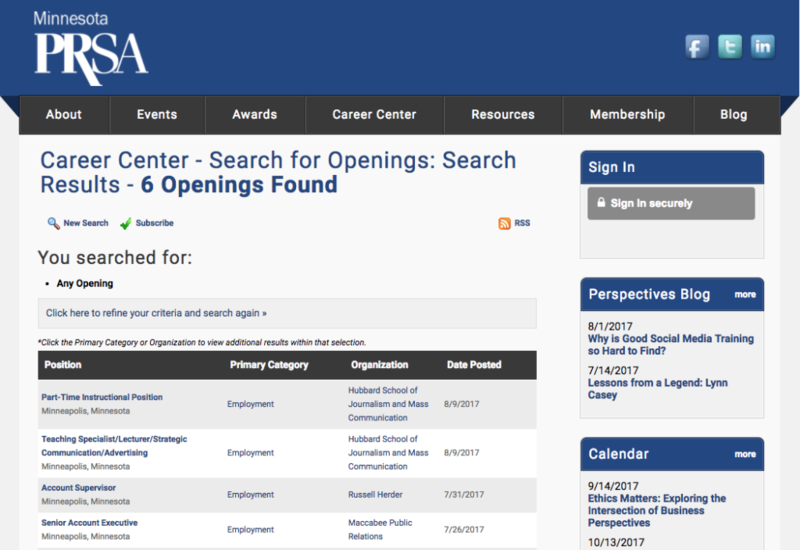 Think about your local professional organizations–for me, that means MIMA and PRSA. Who largely makes up those groups and attends those events? I’d say agency folks. I remember when I was on the PRSA board, there was routine discussion about what we could do to recruit more corporate-side folks because we always seemed to lean agency-side (that’s been a MN PRSA label for years). Look at the awards around town. I just outlined the prominence of agency folks in the 32 Under 32 Awards. Look at MN PRSA’s Young Professional of the Year Award–5 of the first 6 winners of that award have been agency-side folks. And, eight of the last 9 Padilla Award winners have also been agency or solo-side pros. Finally, as I think about my experience personally, I think about the people I’ve worked with and know on the agency side and people I know on the corporate side. No question, my agency friends (largely) are more networked and connected than their corporate counterparts (with the exception of some folks like Jen Joly at Patterson Dental, Kevin Hunt at General Mills, Jamie Plesser at Allianz and Susan Beatty at US Bank). 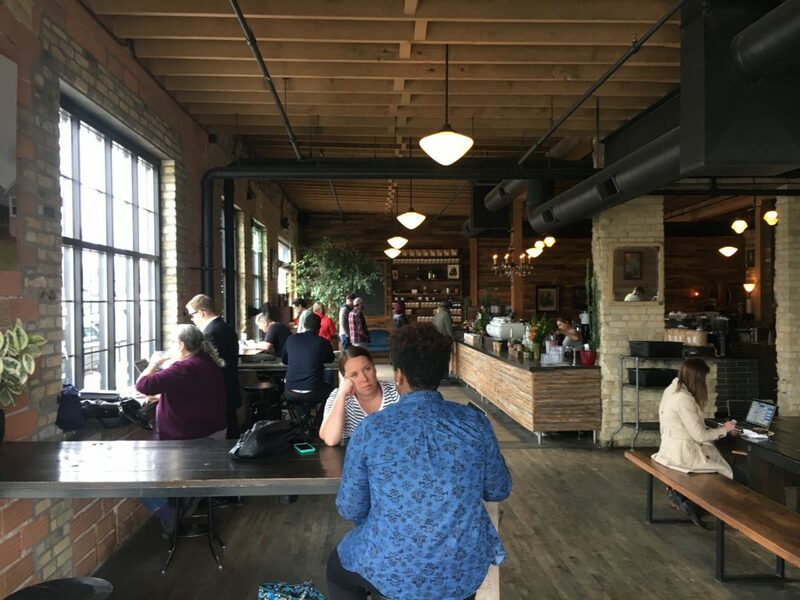 And, in my experiences working for corporations in the Twin Cities, those folks rarely (if ever) left the building for coffees and professional development events. So, what’s going on here? Why are agency folks so connected, while corporate folks tend to stick around the office so much more? 1: New business is a BIG motivator. Agency folks, like me, essentially get paid to know a lot of people. Because, you just never know where that next piece of new business will come from. So, they show up at events. They go to coffees. They apply for awards. Because all that helps them get their agency’s name out there. 2: Agency people, by their nature, are a bit more outgoing. I know this is a generalization, and it’s obviously not always true, but I’ve really found this to be a trend line in my career. Agency people are just more gregarious than their corporate counterparts. I mean, there’s a reason many agencies have beer wagons roaming the offices at 3:30 on Friday afternoons. Bottom line: The more outgoing agency folks are drawn to these social situations (coffees, events, etc. ), while corporate folks seems more inclined to stay within their four walls. 3: Agencies trend younger. No surprise here, right? And I also think people who work for corporations tend to trend a bit older. Think about a typical career track. You start your career working for a big agency in your early 20s. You travel a lot. You’re not married nor do you have kids, so it’s not a big deal. Then, you work your way up the ladder, and you want more responsibility. You take a corporate job. You get married. You have a kid. You have another. Next thing you know you’re 37 and it’s pretty tough to leave that corporate gig where it’s fairly balanced and you now have 25 days of PTO to use for kid sporting events and vacations. So yeah, I think by writing this I’m confirming what I’ve thought for years: Agency people really are more networked than their corporate counterparts. Note: Photos courtesy of Minnesota Interactive Marketing Association. Being a solo consultant is a lonely existence. It’s definitely one of the few drawbacks to this lifestyle. 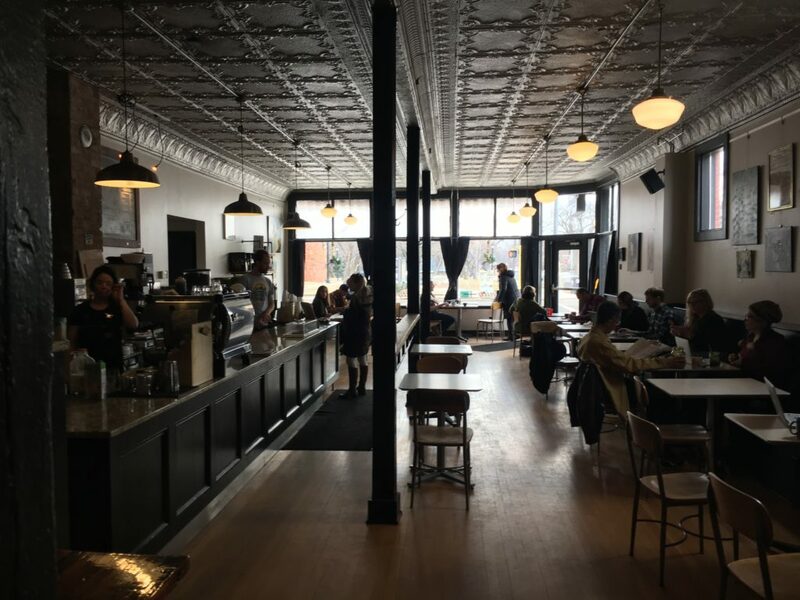 So, I make a habit of getting out of my home office as much as I can to the neighborhood coffee shops in Minneapolis. And, I have plenty of options, because there are a TON of them. It’s one of the many reasons I love living in the city. 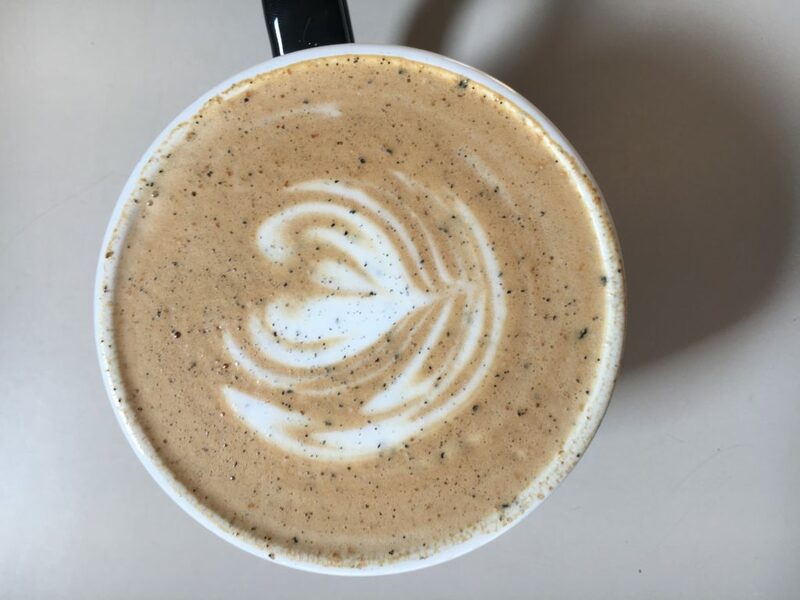 And, since more companies are embracing a more flexible work environment and allowing people like you to work from home and coffee shops from time to time, I thought I’d put my eight-plus years of experience working from local coffee shops to good use and create a list of my favorites. So, below, you’ll find nine coffee shops I probably work from the most. I attempted to grade them on a number of factors: environment, coffee, food options, parking and seating. 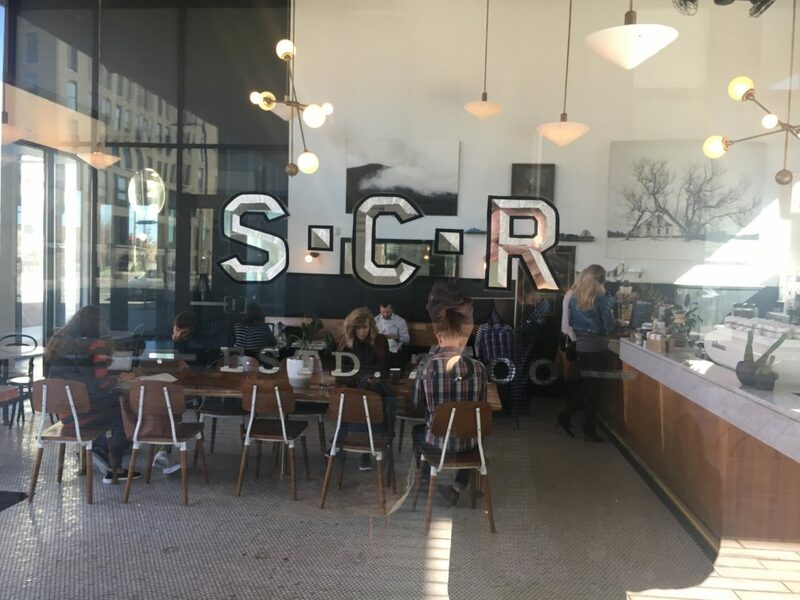 I then gave each coffee shop an overall grade–remember, it’s a grade that revolves around what the coffee shop is like as a place to work, not the coffee shop itself (case in point: I LOVE Spyhouse NE, but it doesn’t get a top-level grade from me as a place to work–see below for why). Now, you’ll probably notice there are a number of fairly popular coffee shops that don’t show up on this list. The new Penny’s is a noticeable miss (I still haven’t been!). Moose & Sadie’s is popular with North Loop types (but I rarely go there given the cluster that is North Loop parking). And Bob’s Java Hut in south Minneapolis is an institution (but just not my jam). Everyone has their favorites–these nine are mine. 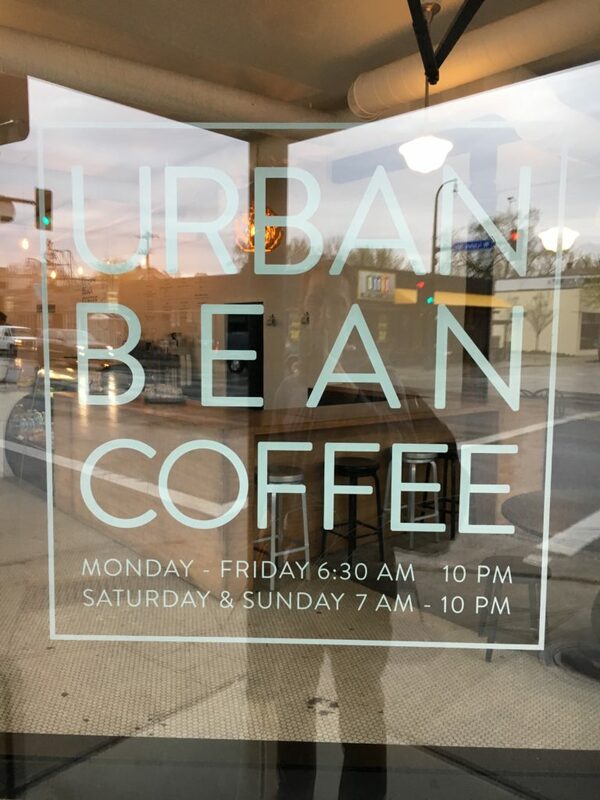 Would love to hear what you think–and your reviews of other top coffee shops in the Minneapolis area. Leave a comment below, or comment on my Facebook post where I shared this post. 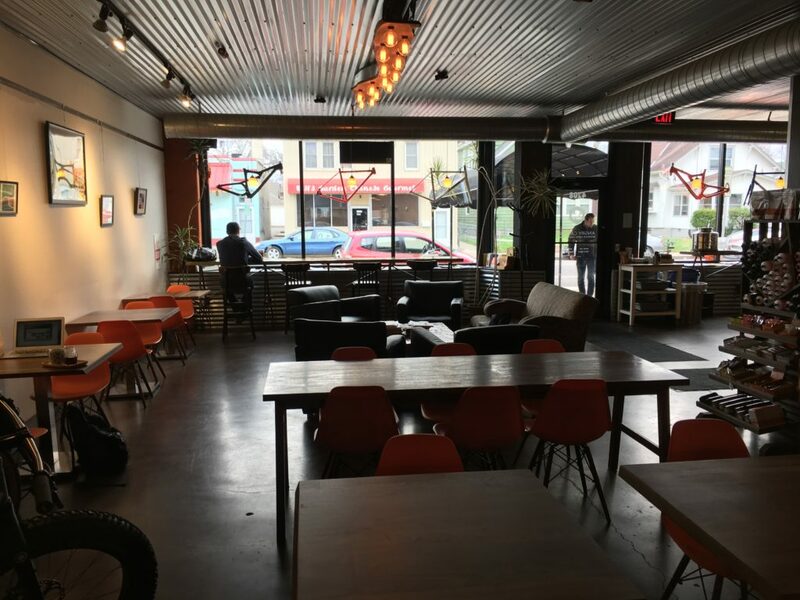 Environment: Half coffee shop, half bike shop, Angry Catfish isn’t your typical venue. But, it does have a nice, neighborhood feel to it. You can find outlets along the bars and outer edges of the coffee shop. And, the music isn’t too loud so you can’t talk to a table-side companion. Drink of choice: I usually just opt for the pour-over Intelligentsia or Ruby coffee of the day, since it’s so damn good. And, I absolutely LOVE the small tray and little pitcher you get for the 12- and 16-oz. orders. Seating: Ample seating. 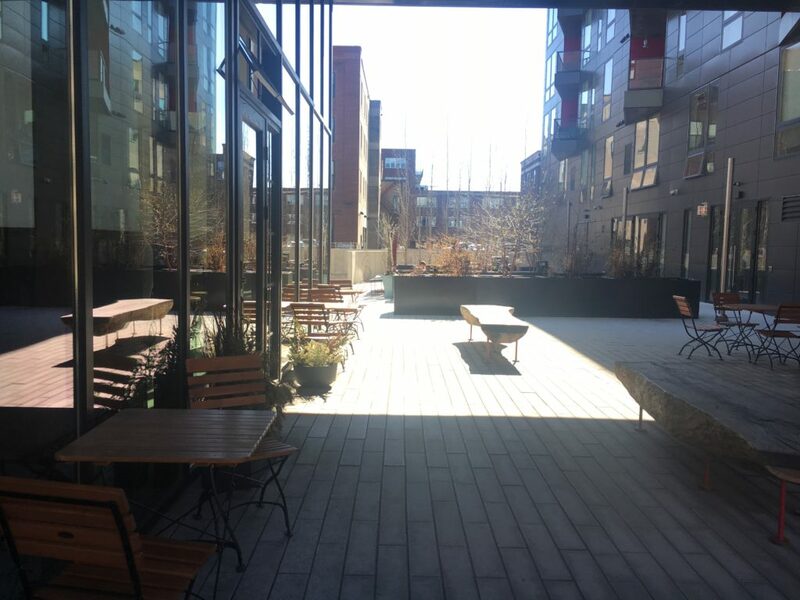 8-10 bar spots overlooking the street. Some informal, couch-like seating. And 5-7 tables for the more serious worker. Parking: Street parking, which is always available. I’ve never walked more than half a block to Angry Catfish. And, of course, bike parking right out front. 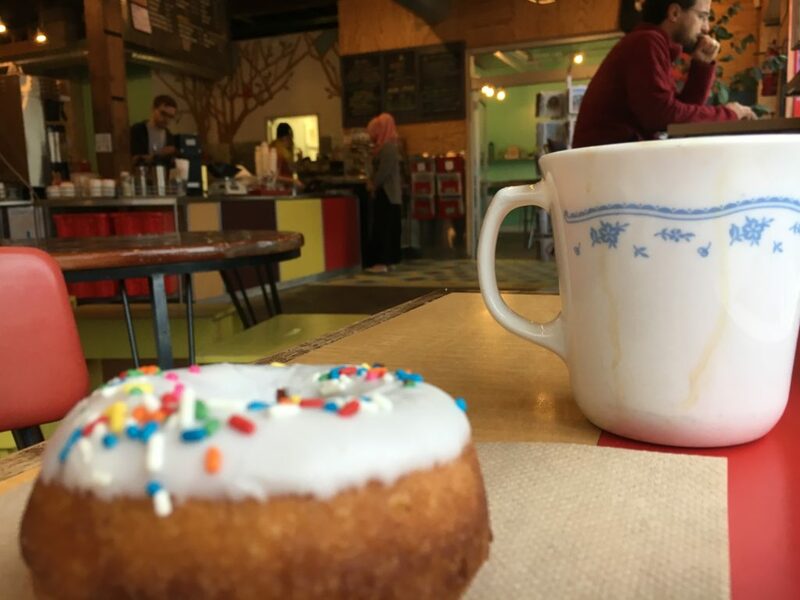 Arik’s Workability Grade: A (HUGE points for being next door to the best donut shop in the city; always pretty quiet, never all that busy and serving one of my favorite coffees–Intelligentsia. Yeah, high marks for AC). Environment: Open, air and lots of light let it through the huge windows in the front of the store. 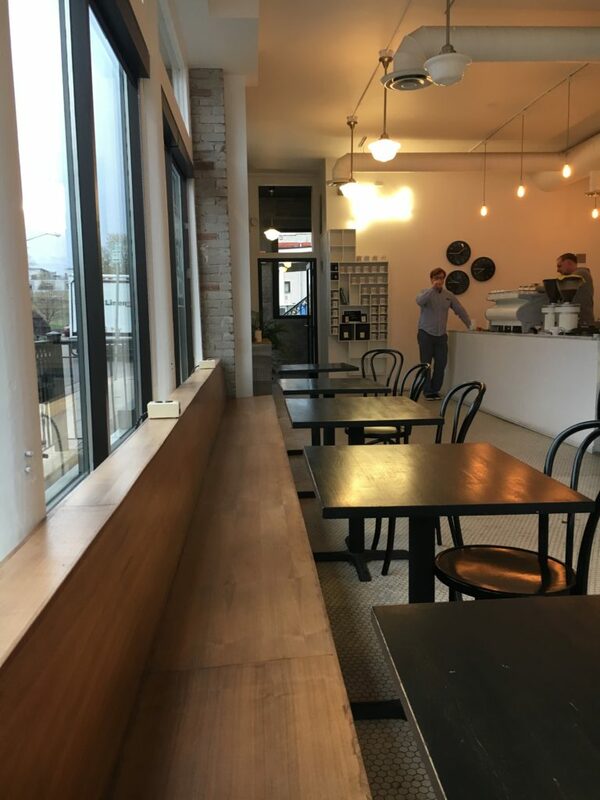 The vibe is modern (the wood booths are my favorite) with its signature pink espresso machine right up front. The neon bars above the coffee bar add a nice touch, too. 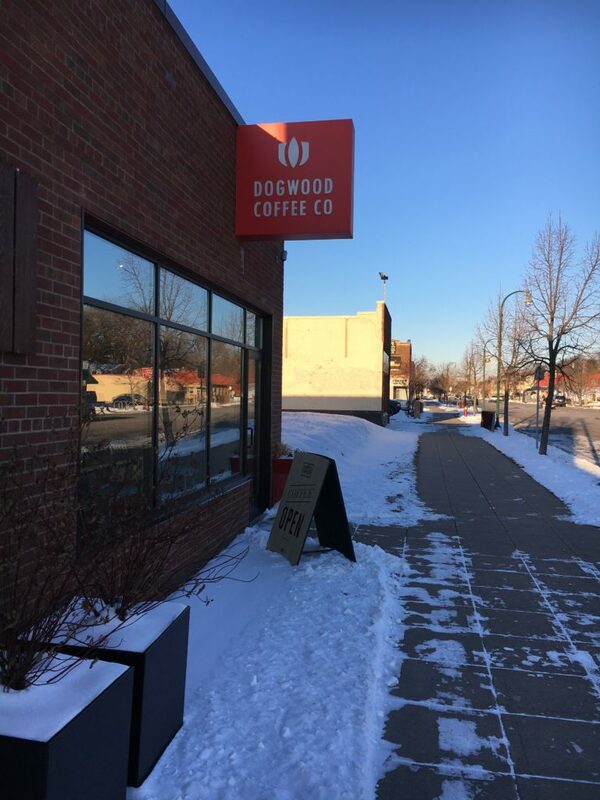 Drink of choice: I’m a huge Dogwood fan, but I usually grab a cup at the much smaller Dogwood in Uptown. I usually just go for the coffee since it’s so damn good. And you really can’t go wrong with any of their blends. 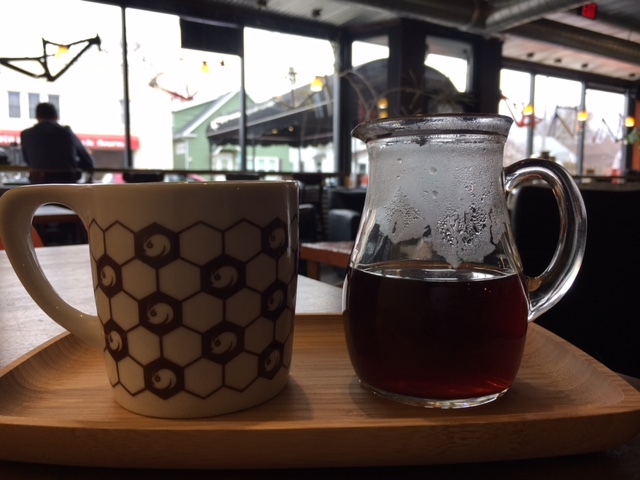 I had the Costa Rica blend (16 oz.) this time around. Wonderful. 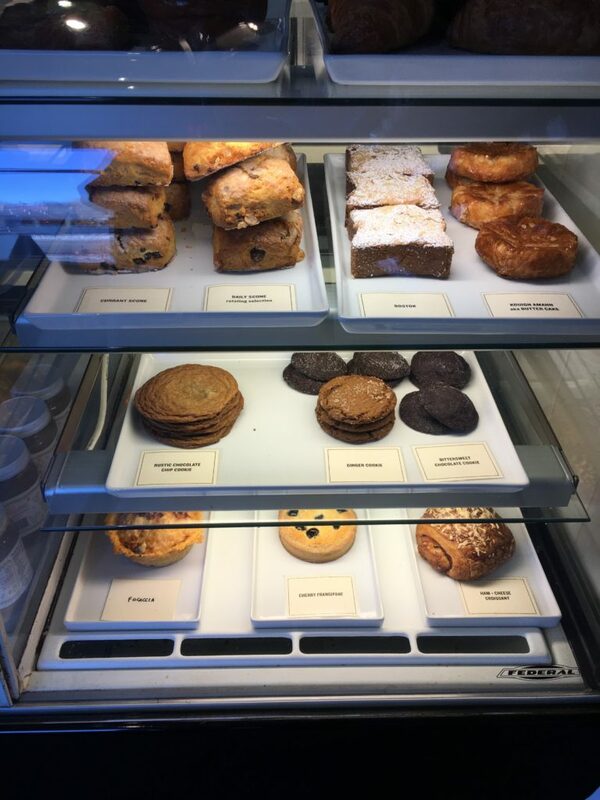 Food options: Dogwood carries a smallish number of Rustica bakery items including cookies, croissants, and my favorite, the danish. I opted for the orange danish, which was the perfect pair with my Costa Rica. 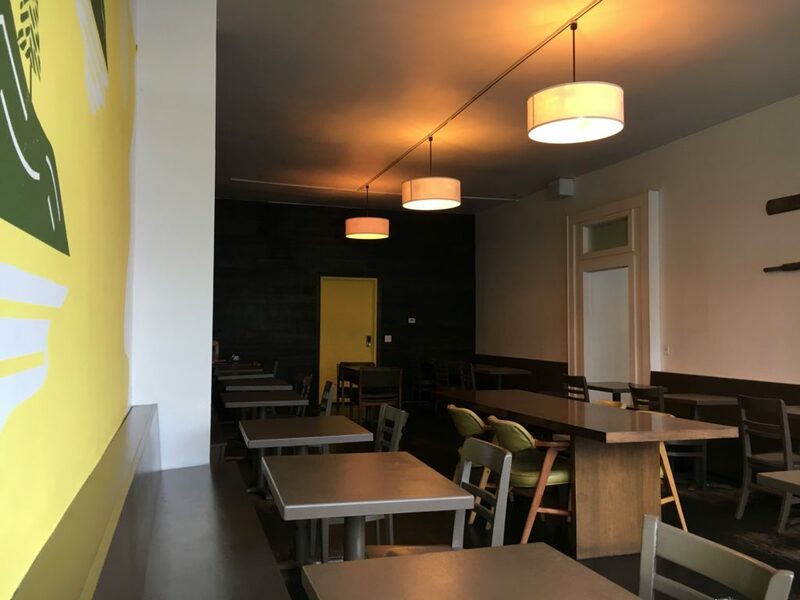 Seating: Dogwood shares a larger space with the accompanying Bodega, but it’s broken up by a wonderfully cozy section of two-person booths that I absolutely loved. 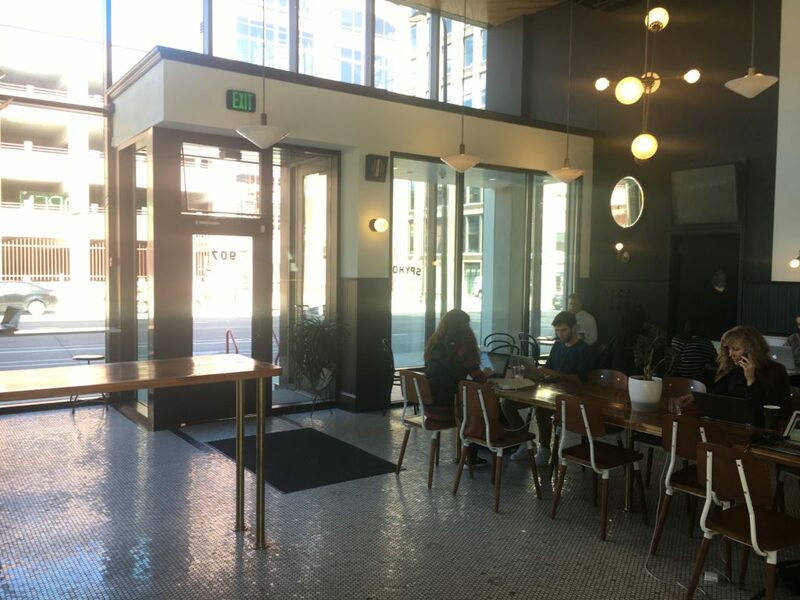 There were also three separate bar areas to work from–one looking out onto Marshall Ave. and the other two overlooking the coffee areas. In total, the space had 12 sitting areas between the booths and small tables and chairs. Parking: Dogwood has about 5-7 spots in its lot in the back of the store. Otherwise, there’s on-street parking on Marshall Ave. Plenty. And free. Environment: Music wasn’t too loud. Acoustics are fairly good. And, there’s ample room even though it is frequently crowded during the day. There are many people working, so it’s a nice place to put down roots for a couple hours. 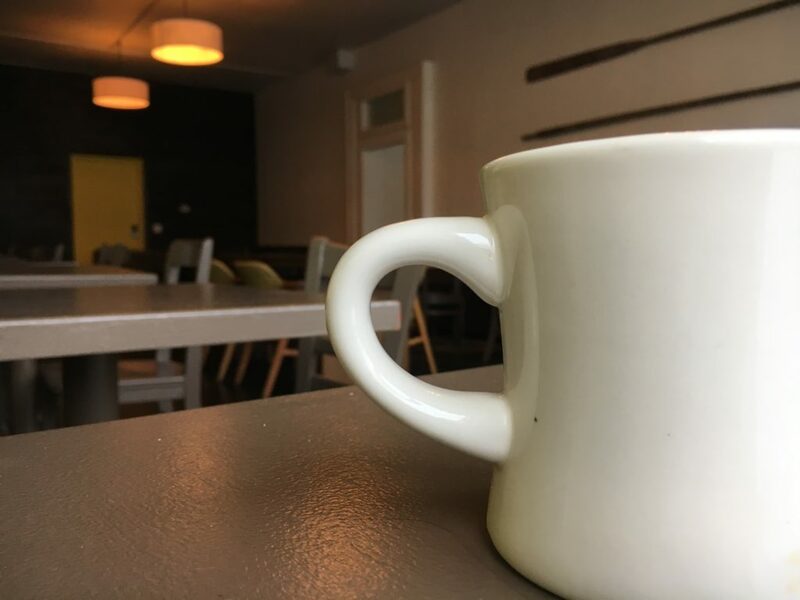 Plus, they have two rooms–a bigger space with the coffee bar, and a side room where I’ve held meetings before. And, as an added bonus, they have the garage door for the summer months. 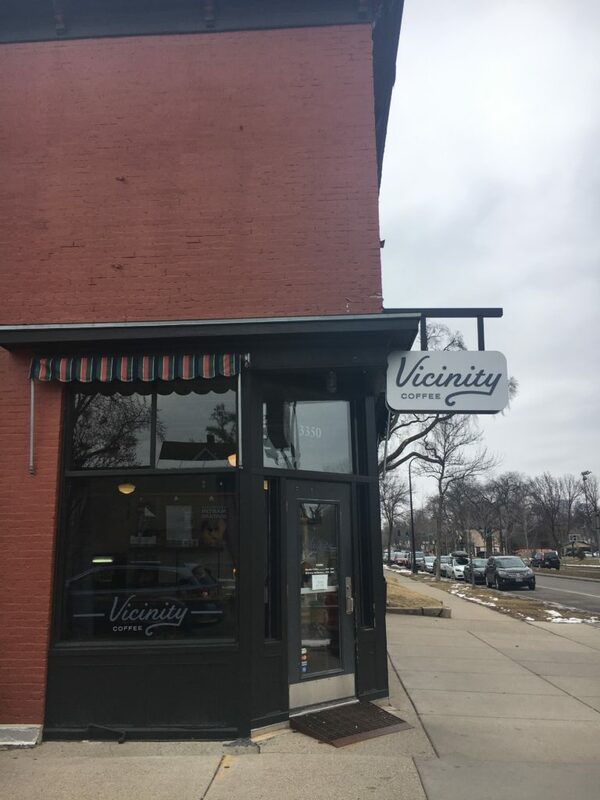 Food options: Vicinity has a small selection of scones and croissants (I believe from Rustica)–so you’re in good hands here. It’s just not my bag. Seating: Ample seating. I counted 14 two-person tables in the main room. And one larger table for group meetings. Also love that many of the tables on the wall have outlets–no shortages here. One of the better spots for seating, actually. Parking: On-street parking nearby. Vicinity is right in the Kingfield neighborhood, so there’s plenty of free on-street parking. No problem. 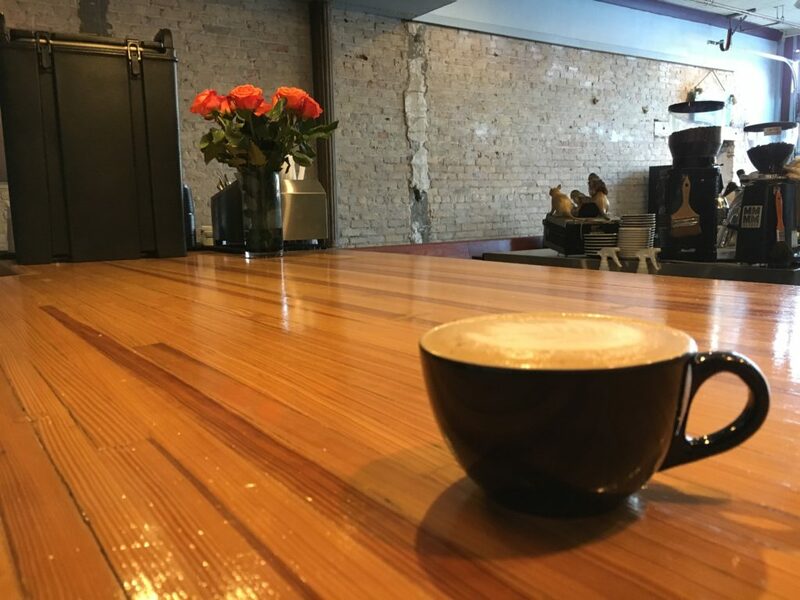 Hours: M-F, 6:30 a.m. – 8 p.m. Environment: Bright, open and airy. And plenty of outlets for the long-term worker bee. I also like that there are two separate rooms at the Wonderland Park location–little more room to breathe and spread out, should you need it. Drink of choice: I usually just go with the brew of the day. In this case, it was their new Tree Hugger blend, which is a dark roast with the body of a light roast. Not usually what I go for, but it was pretty good (not great). I’ve really come to love their Snowshoe blend. 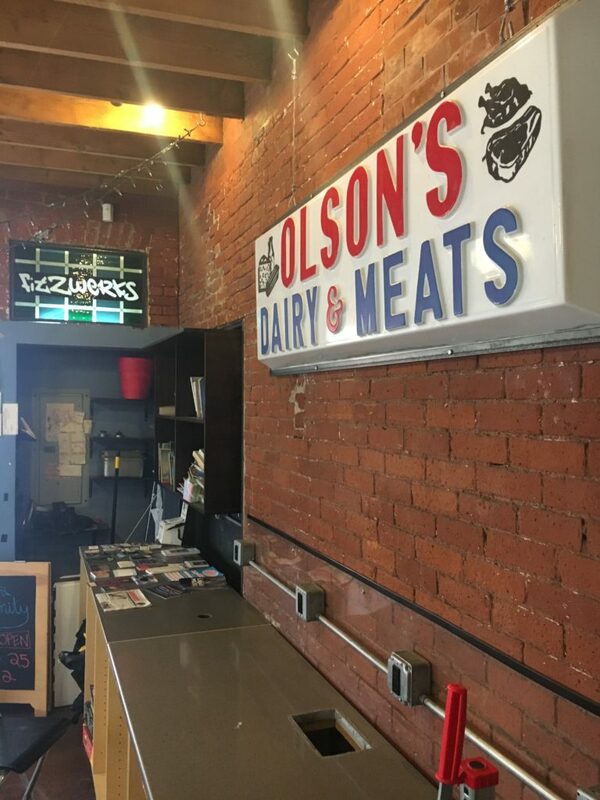 Food: They have a variety of bakery items and oatmeal, but nothing too crazy. 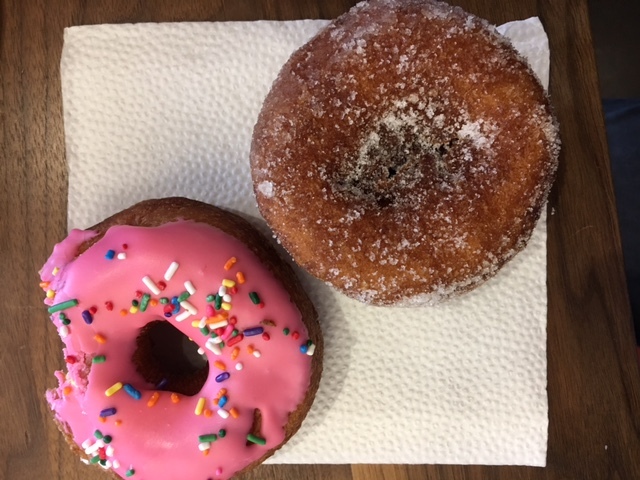 In fact, I stopped at Baker’s Wife on the way and nabbed a couple State Fair donuts (again, best donut in the state). Seating: Plenty. And, I like the options: booths, tables, stools. Perfect. 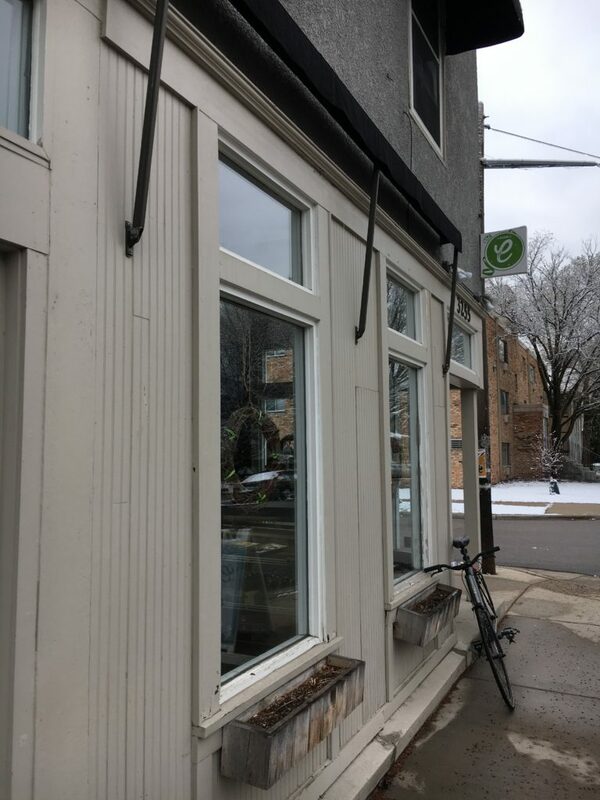 Parking: On street (on Minnehaha and the side streets) as well as a small lot out back. And, all free. 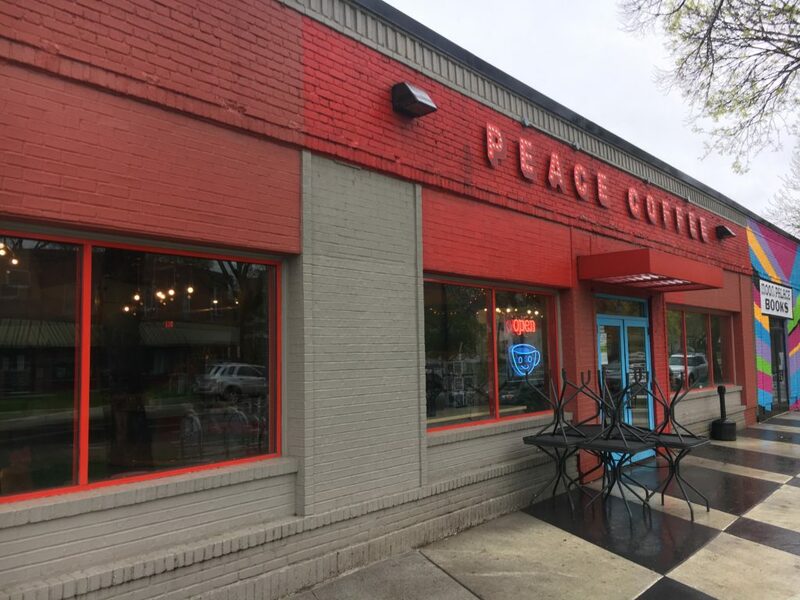 Arik’s Workability Grade: B (overall, a pretty solid place to work; love the vibe, but I just have never loved Peace Coffee; and, it does tend to be a bit crowded at key times). 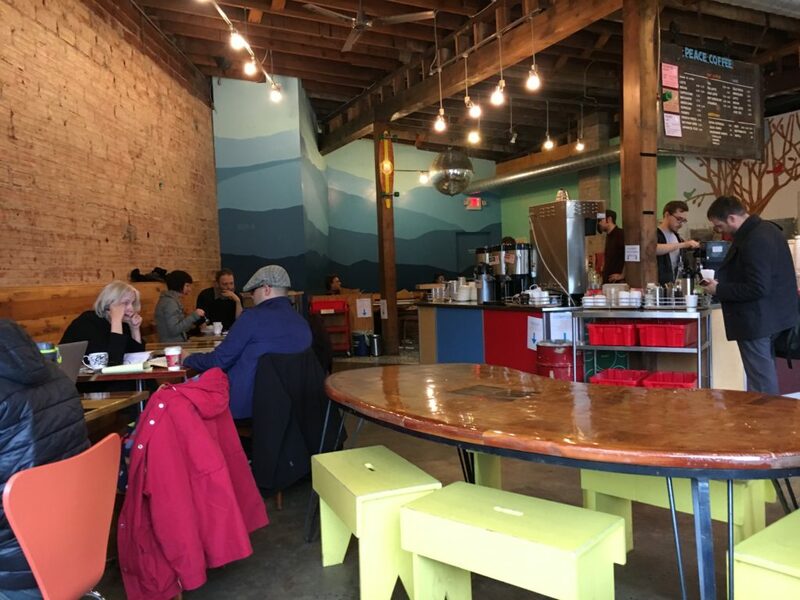 Environment: What you’d expect for a North Loop coffee shop. The classic tile is a nice touch. Love the high ceilings. And you’re surrounded by light with all the windows. You could do worse in terms of a place to work for a few hours. Drink of choice: Just like when I visited the Spyhouse NE location, I opted for the Cold Brew (this time with a little lavender syrup). Outstanding. 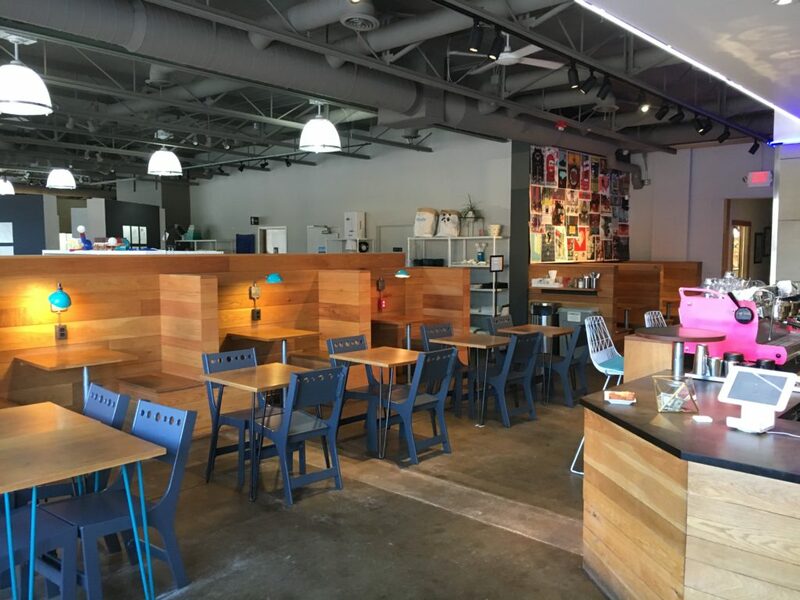 Seating: A few tables and a few different bar/high top areas. Not a ton of seating. And, outlets were tough to find, too. A few of the bar items hardly had any. Kind of a big miss for a brand new place. Parking: On-street, free parking right nearby. Unheard of for North Loop, but it’s just far enough on the fringes where you have on-street parking for free on 10th. I’m sure that will change soon, but for now, take advantage. 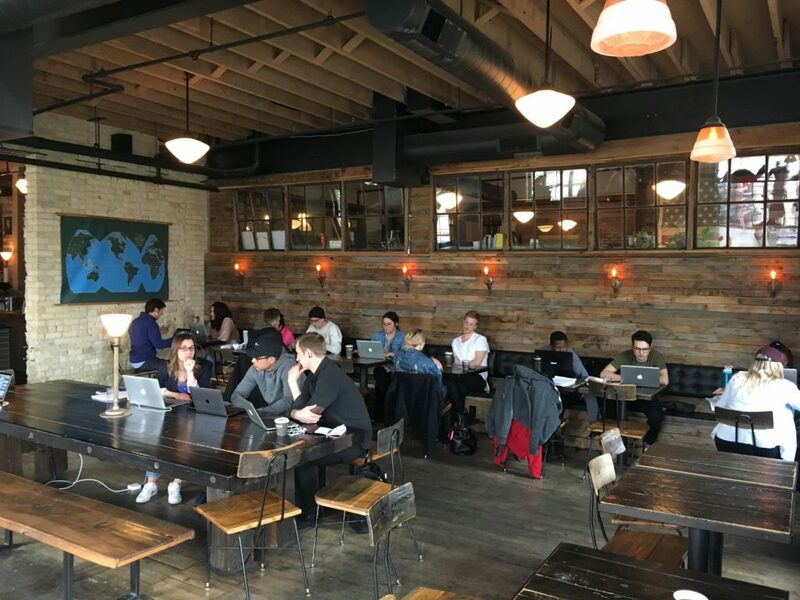 Environment: Maybe one of my favorite coffee shops in South Minneapolis to work from because it’s so quiet and rarely super busy. And, you’ll find an outlet nearby almost every table (a must for today’s coffee shop). The wi-fi is fast and reliable and it’s also relatively quiet. You’ll usually find many people working from Canteen throughout the day. 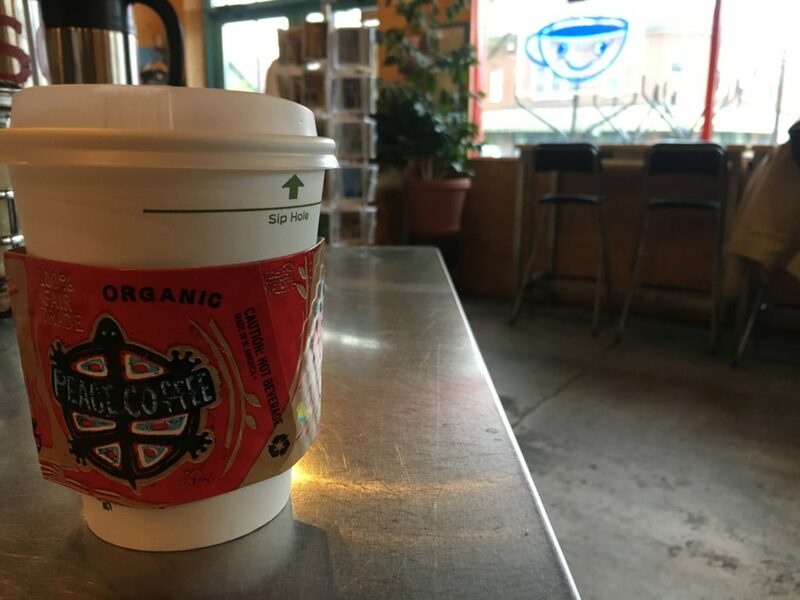 Drink of choice: While Canteen has the requisite selection of lattes and specialty drinks, I always opt for a straight cup of the wonderful Kickapoo coffee. Smooth and delicious. And, you can get the bottomless cup for just $3.25–perfect for the worker who’s going to set up shop for 1-2 hours. Food options: Although I haven’t tried it yet, people rave about Toast Bar. I just haven’t gotten on board with the whole toast trend. The “Hollybars” also look pretty darn good–a selection of PB&J, coconut almond and peanut butter chocolate chip are usually on hand. 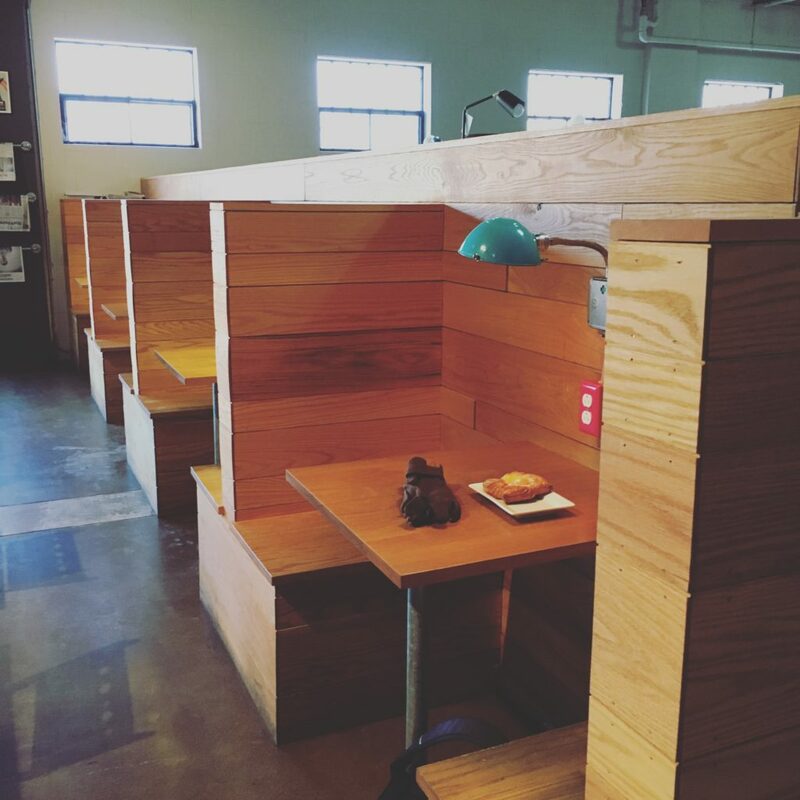 Seating: This is the strength of Canteen as a coffee shop for the remote worker. PLENTY of seating throughout–even when it’s busy, there seem to be multiple open tables. Parking: On-street parking is always available. No problem here. Environment: The music isn’t over-powering, so you can actually work to it. 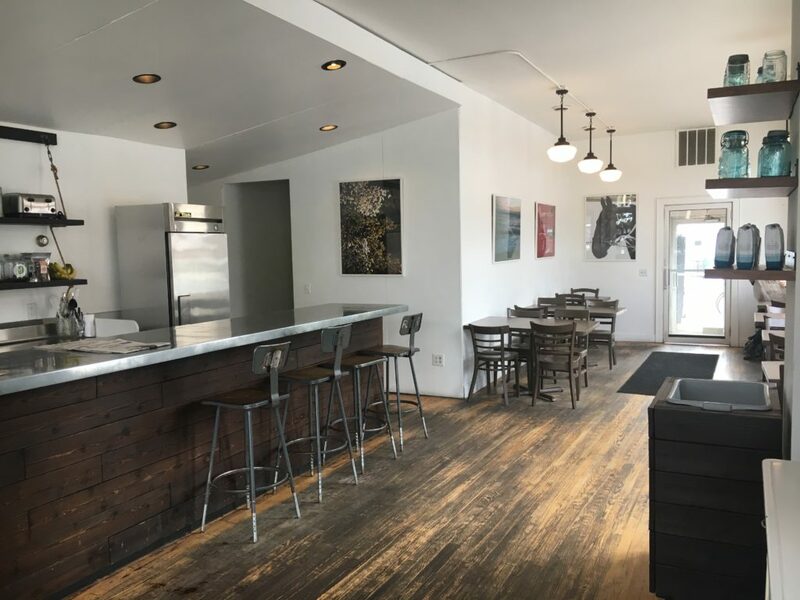 And overall, the vibe is pretty urban with exposed brick walls, the garage door and an authentic south Minneapolis feel. The room also has tons of outlets throughout and free wi-fi. No complaints here. Drink of choice: The Kingfield. It’s Five Watt’s most popular drink. 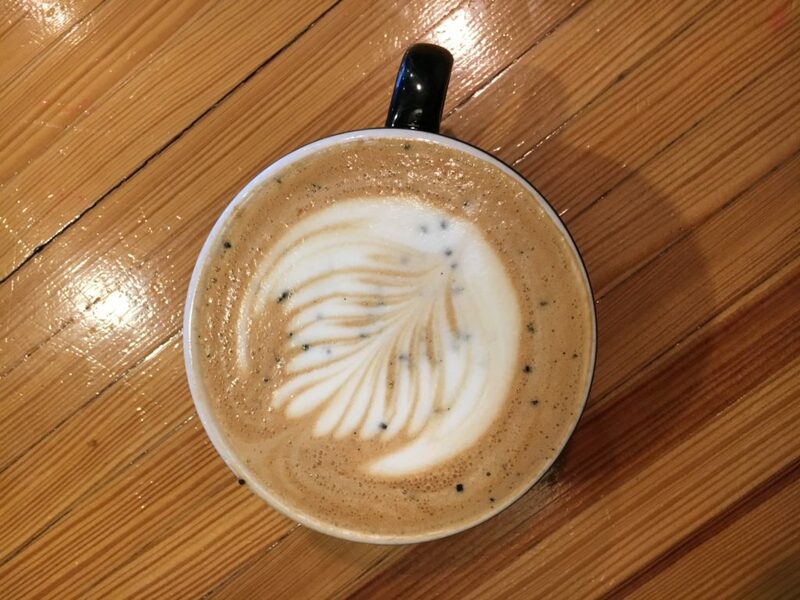 I’m not a big latte guy, but I’ve tried it a few times and really enjoy it. But, at $5 a pop, it’s a lot to stomach for this cheap guy. Definitely a splurge item for me. 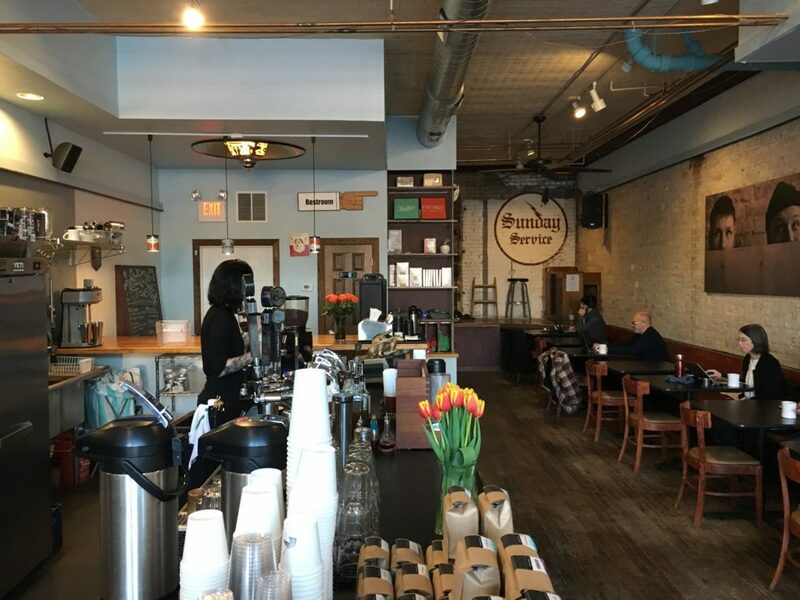 Haven’t tried the drip/pour-over coffee, but they do use a roastery out of Kickapoo, Wisc., down south of LaCrosse where my folks grew up–so huge bonus Hanson points there! One more note: Free refills on drip coffee–even if you purchase one of the espresso drinks. Food options: Five Watt brings in an assortment of Patisserie 46 breads and pastries. Not my favorite, but it’s usually a small selection of croissants, scones and muffins. 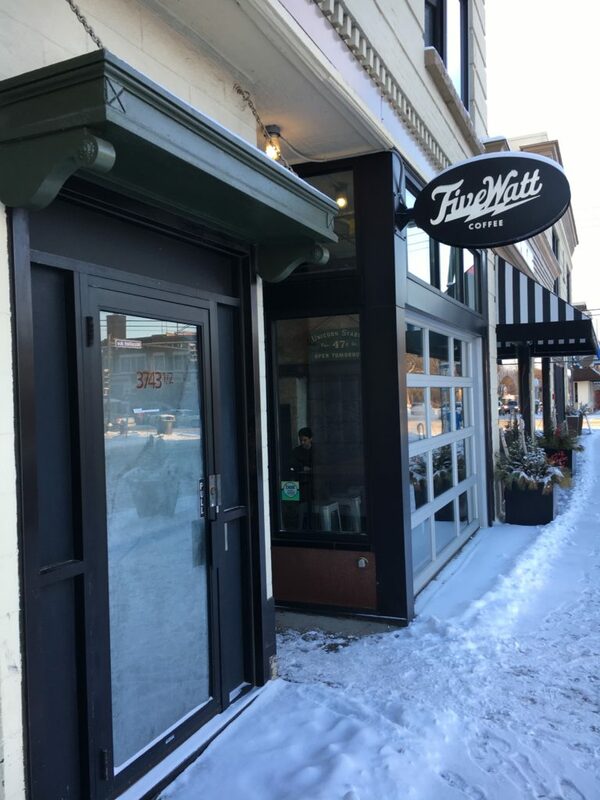 Seating: Five Watt is a small place. 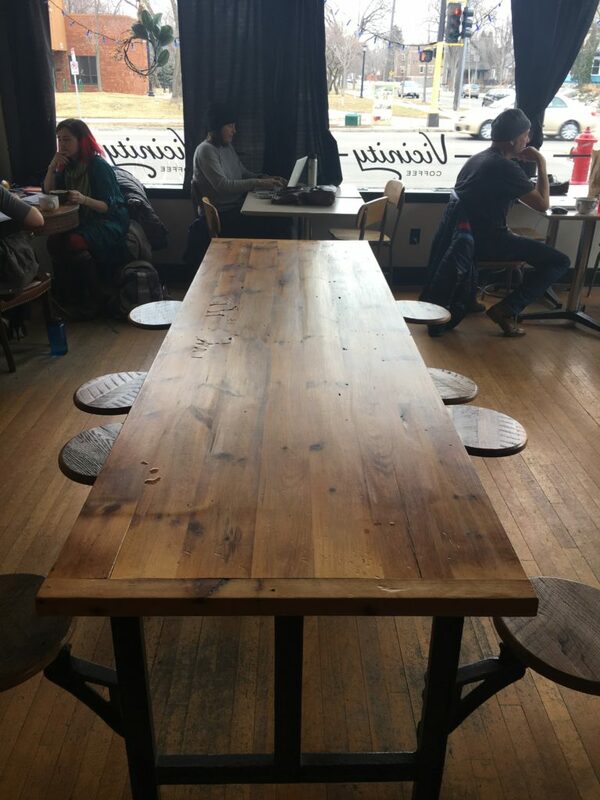 I counted 12 tables total–and they’re all two-person tables. But, it does have a great bar I love to work from, and in the spring/summer/fall, they have a nice outdoor patio (although it’s right on Nicollet). Parking: Right on Nicollet is the best spot, and there are usually spots. So, overall, not too shabby. Arik’s Workability Grade: B (would easily be higher if THEY HAD MORE ROOM! 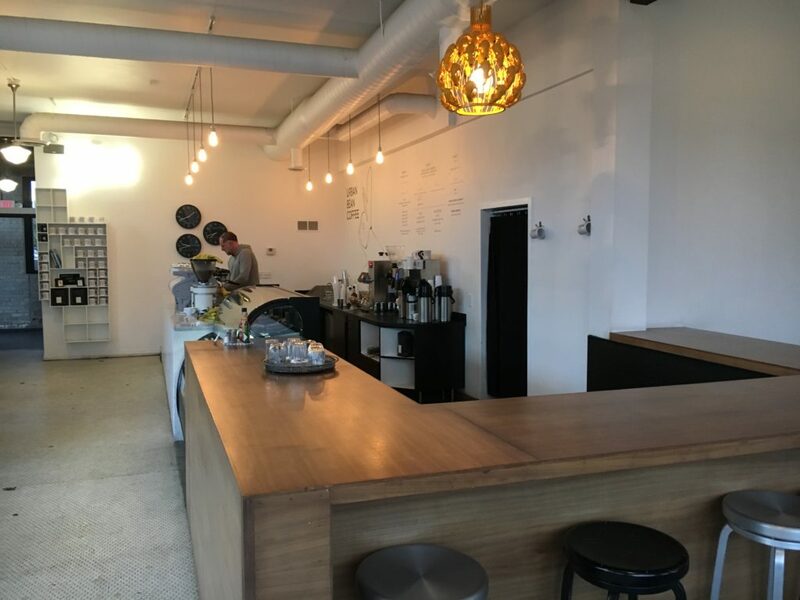 Specialty drinks are very good, and the space itself is tremendous. It’s simply far too small and always crowded). Environment: Somewhat loud. Lots of people. Always crowded. Not optimal work environment, or great for coffee meet-ups. 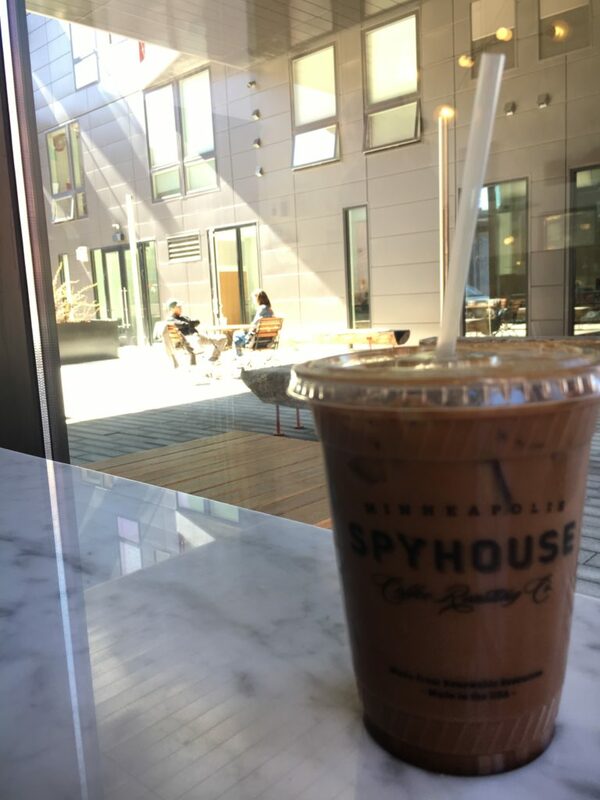 Drink of choice: Seems like most folks opt for Spyhouse’s espresso drinks, but since winter is now officially in the rear-view mirror, I opted for the cold brew, which was amazing. 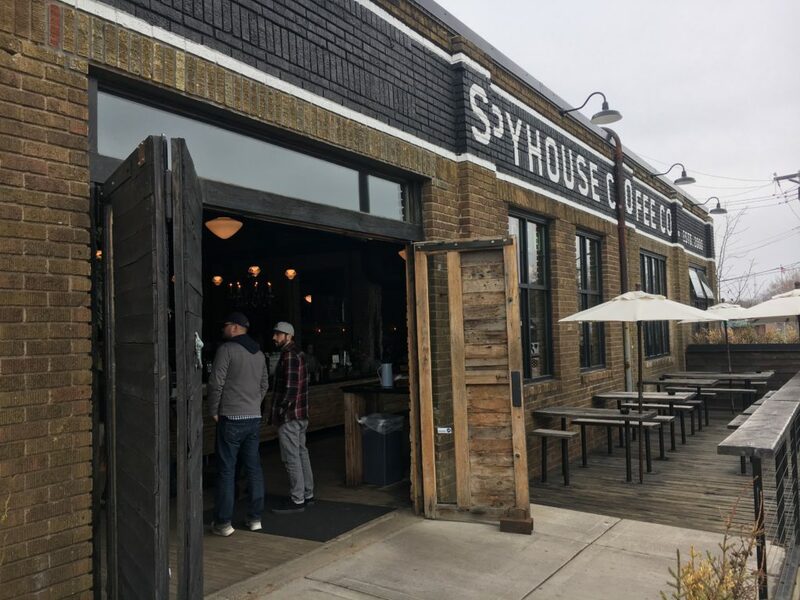 I’ve had the Spyhouse coffee before though, and it’s above-average. No Intelligenstia or Dogwood, but it’s very drinkable. Food options: Bakery items from Walnut Bakery are typically pretty solid. 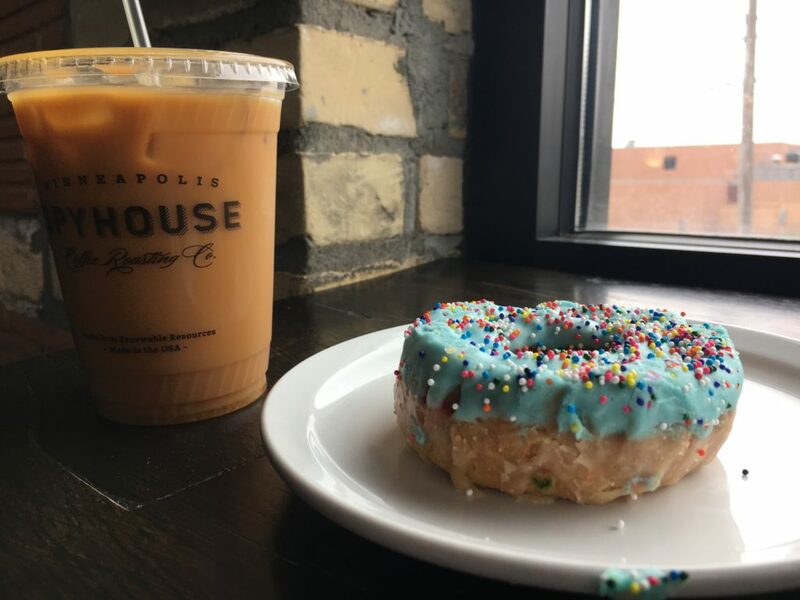 I opted for the old fashioned sprinkle donut on this visit which was very good. Seating: Plenty of seating, but I have yet to work at Spyhouse NE when it’s not absolutely packed. So, seating is definitely an issue. If you’re looking for a spot where you’ll be guaranteed to find seating, an outlet and the ability to work in peace, this isn’t the place. 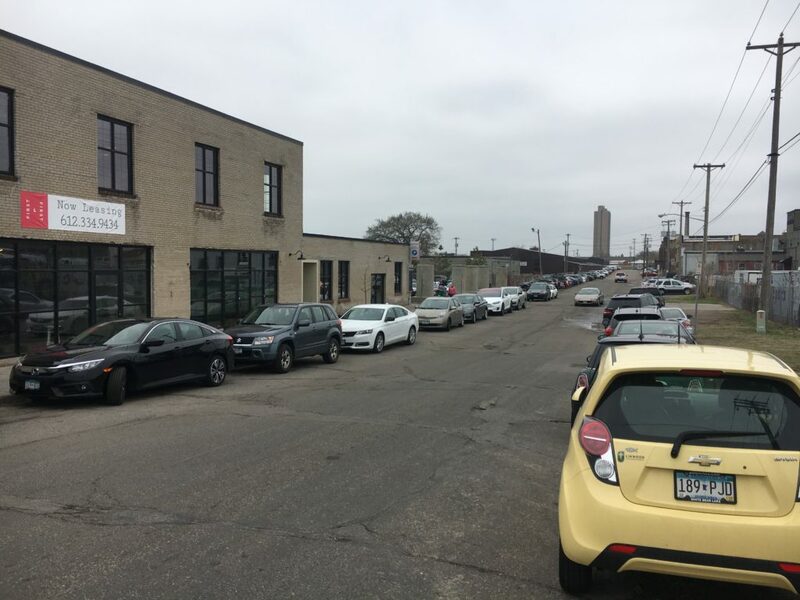 Parking: Let’s be honest, parking is a disaster around Spyhouse NE. You can park on the road (shown here), but there’s no guarantee a spot will be available. 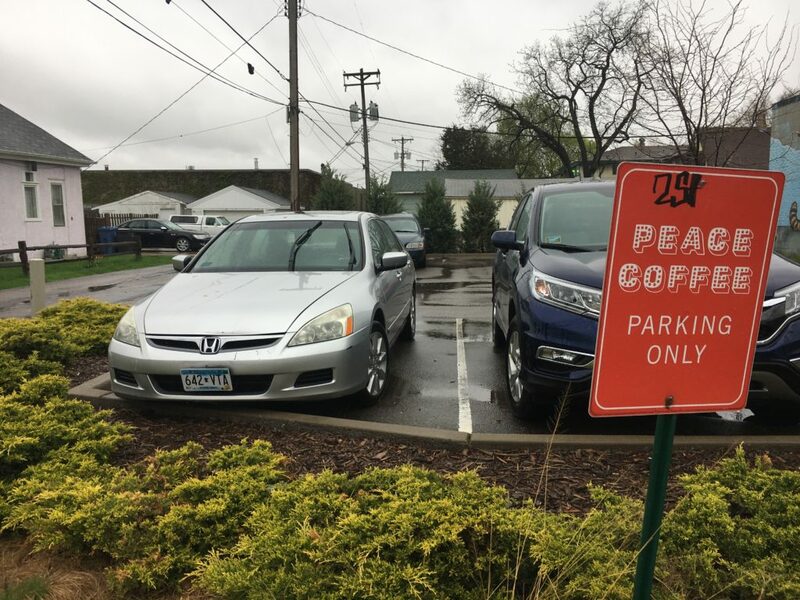 And, other lots nearby are reserved for employees/customers of other companies. I’ve never loved the parking situation here, and it usually drives me to find another place to work. Environment: Open, airy and usually pretty darn quiet. Lots of outlets. Lots of space. One of the better environments to get stuff done. 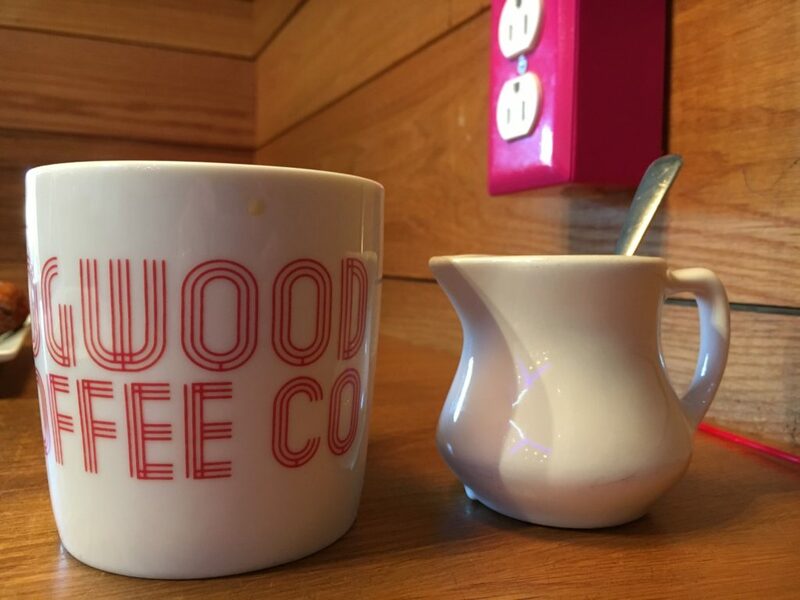 Drink of choice: I opted for the house coffee–and why wouldn’t you when it’s Intelligentsia. A refill did cost me $1.50 though, which I bristled at. Food options: Had a small selection of bakery items including croissants and scones. Nothing too outstanding. But, pretty standard for most of the coffee shops on this list. 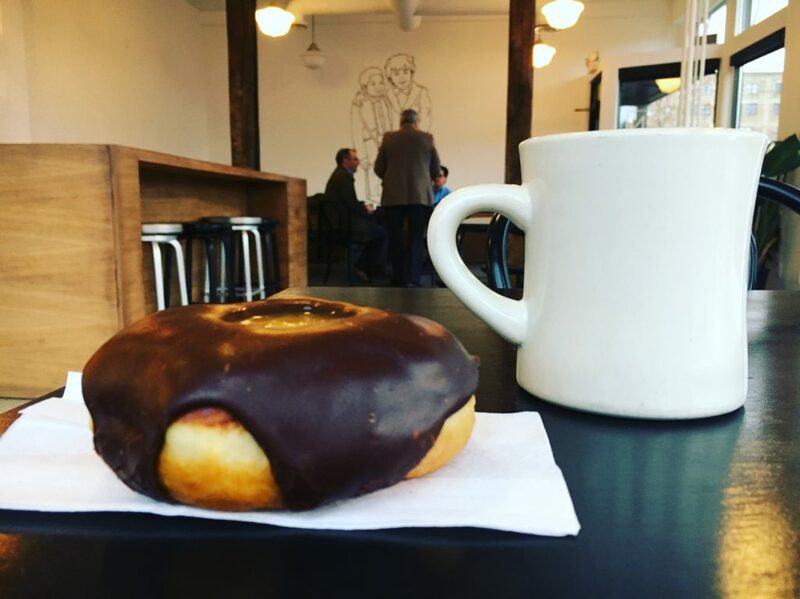 That said, I opted to pair my Intelligentsia with a salted caramel/chocolate donut from nearby Glam Doll Donuts. Seating: Ample seating and a variety of options. They have 4-5 tables right against the windows, which are nice. They have a couch for more leisure reading/working. And, they have bigger tables for larger groups. Parking: On-street parking is usually pretty easy to find. But, they do have a small lot that is also free on the north side of the building.